Please read all of the following manuscript preparation instructions carefully and in their entirety. The manuscript must be in good scientific English; this is the author's responsibility. All authors must have read and approved the most recent version of the manuscript. Manuscripts submitted via any other medium will not be processed. 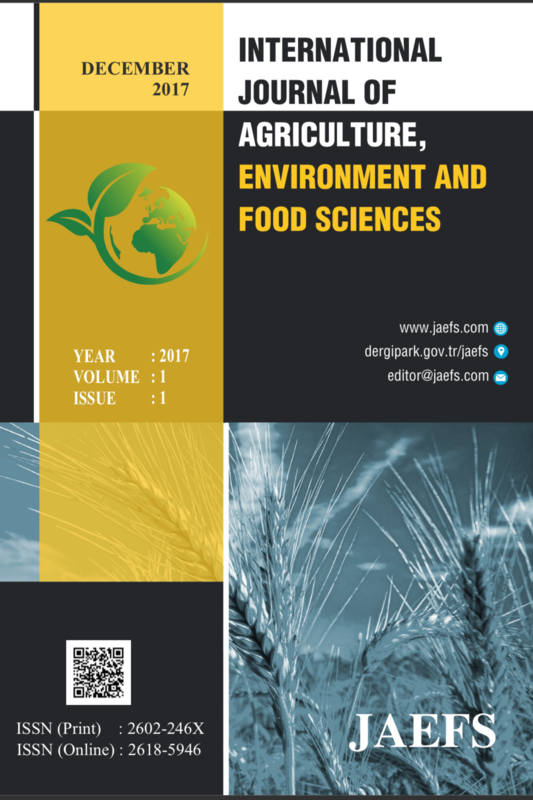 Manuscripts submitted to the International Journal of Agriculture, Environment and Food Sciences will first go through a technical evaluation process where the editorial office staff will ensure that the manuscript has been prepared and submitted in accordance with the journal’s guidelines. Submissions that do not conform to the journal’s guidelines will be returned to the submitting author with technical correction requests. The journal management requires that all authors register to ORCID at http://orcid.org/register and get a free ORCID ID. We are using iThenticate plagiarism solution and our maximum allowed score, for the document in which the Materials and Methods and References sections truncated, is 20%. Higher scores are not allowed and the author will be given the plagiarism report and the manuscript will be returned to the authors. Manuscripts must be prepared as a Microsoft Word file. Word document, Times New Roman, 10 point, single line space. Maximum length for articles is 20 pages. Articles over 20 pages in length can only be considered on an exceptional basis. Use bold 14-point Times Roman font. Use centered, bold 10-point Times Roman font. Use 8-point Times Roman font. and get a free ORCID ID. Each article is to be preceded by a succinct abstract, of up to 200 words, that highlights the objectives, methods, results, and conclusions of the paper. The abstract should state briefly the purpose of the research, the principal results and major conclusions. The abstract body is typed in Times New Roman, 10 pt. About four Keyword or phrases in order of importance, separated by commas and typed in Times New Roman, 10 pt. Use bold, lowercase, 10 Times New Roman font for headings. This should define the problem and, if possible, the frame of existing knowledge. Please ensure that people not working in that particular field will be able to understand the intention. The word length of the introduction should be 150 to 300 words. Discussion should interpret the results in reference to the problem outlined in the introduction and of related observations by the author/s or others. Acknowledgements of financial support, advice or other kinds of assistance should be given at the end of the text under the heading "Acknowledgements". The names of funding organizations should be written in full. They should be grouped at the end of the paper in surname order of appearance. Use lowercase, 10 Times New Roman font for References. Surname, N.N., Surname, N.N. (Year). The full title of the article. Journal Name, volume and issue, first and last page. DOI number. Surname, N.N. (Year). Title of the thesis, University and Faculty, City. pages.